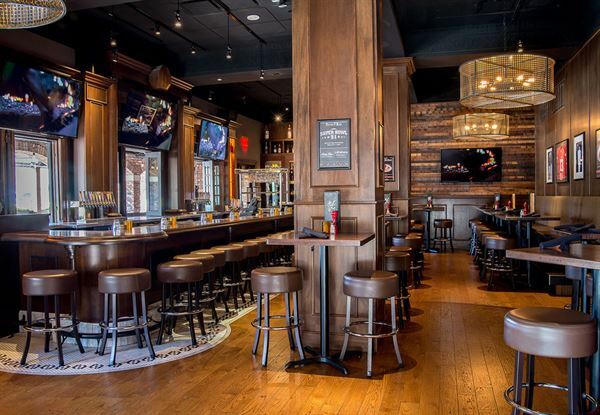 Are you looking for a location to have a happy hour social, business event or holiday party? The Thirsty Lion at Scottsdale Fashion Square has a beautiful patio that features a variety of outdoor seating options and a private bar for your next event. Inside, the private bar and Lion's Den area give you a semi-private event space that provides the perfect gastropub environment. Popular Appetizer Packages (Packages are priced per guest with a 12 guest minimum.) Traditional | $17.95 per person • Chipotle hummus platter, pulled pork slider, artichoke & spinach dip with corn tortilla chips and salsa, hand-breaded chicken tenderloins with peppercorn ranch. Signature | $19.95 per person • Bacon wrapped BBQ prawns, grilled burger slider, seasonal vegetable platter, sautéed Brussels sprouts, oven baked soft pretzels with beer fondue, jalapeño jam and sweet mustard. Chef's Choice | $25.95 per peron • Bacon wrapped BBQ prawns, artisan cheese platter, chipotle hummus & flatbread, combination sushi platter and ahi poke wontons. Buffet Packages (Buffets are priced per guest with a 15 guest minimum) Slider Bar | $19.95 per person • Grilled Burger Patties • Spicy Fried Chicken • Smoked BBQ Pulled Pork • Complete with chipotle mac & cheese, lettuce, tomato, onion, cheddar, Swiss and pepperjack cheese, chipotle mayonnaise, Newcastle BBQ sauce and a variety of condiments. • Served with house green salad and Caesar salad. Grilled Burger Bar | $20.95 per person • ½ lb. USDA Ground Beef Patties • Marinated Breast of Chicken • Impossible Burger. • Complete with Napa slaw, chipotle mac and cheese, lettuce, tomato, onion, cheddar, Swiss and pepperjack cheese, chipotle mayonnaise, Newcastle BBQ sauce and a variety of condiments. • Served with house green salad and Caesar salad. Asian Market Buffet | $22.95 per person • Combination sushi platter, Asian wonton salad, soy glazed edamame and jasmine rice or kimchi fried rice. • Choose 3 of the following: Kung Pao Chicken**, Orange Chicken, Thai Red Curry Chicken, Korean Fried Chicken, Gochujang BBQ Pork Fiesta Bar | $23.95 per person • Grilled chicken breast, tender marinated steak, pork carnitas, grilled peppers & onions, white corn and flour tortillas, tortilla chips, house made jalapeño cheddar queso dip, Santa Fe bacon black beans, shredded cheeses, sour cream, fresh salsa, guacamole, jalapeños, olives, lettuce, green onions and tomatoes. • Served with cilantro jasmine rice, southwest salad and cilantro-lime vinaigrette. Southern BBQ Buffet | $21.95 per person • Smoked pulled pork, grilled BBQ smoked chicken breast, chipotle mac & cheese, Santa Fe bacon black beans, house made jalapeño queso dip, Napa slaw, and jalapeño corn bread. • Add St. Louis Smoked Ribs: $3/person Please see attachment for additional information and menu options. The Lion’s Den is a semi-private event venue space that provides the perfect gastropub environment. Our private bar provides a warm, rich and relaxed atmosphere with an expansive full-service bar, high-top gastropub seating and French doors that create an open-air bar. The Pub Patio is the perfect setting for any intimate function.The picturesque brick arches, paver walkway, bistro lighting, fountain, and French bar doors capture the feeling of experiencing something special.